Khamsin is the Flame Haze contracted to Behemoth. While he is one of the oldest Flame Haze in history, perhaps even thousands of years old, he bears the appearance like a ten-year-old boy. Khamsin has the ability to create and move stone golem-like creatures and control stones. 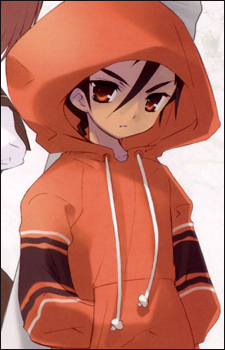 Khamsin comes to playing a major role in Shakugan no Shana III (Final) than in the seasons before. He helps Shana and Wilhelmina in order to stop the Snake of the Festival from creating Xanadu. In the end, Khamsin dies due to being hit in a battle right before the end of the fight. He says farewell to Wilhelmina, Margery Daw, Shana and Yoshida Kazumi, to whom he had plays a great role.